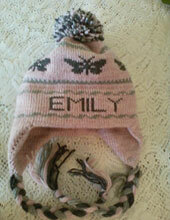 Custom design your own high quality wool winter hat. Made from your choice of 100% pure wool or wool blend. Unlike your typical thin light weight hats, these are warm hearty hats. Choose your own colors, patterns and shape. You can even put your name or any other word that means something to you. 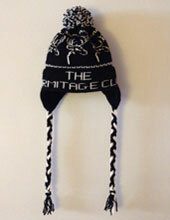 These Winter Hats can be picked up in West Dover, VT or can be shipped anywhere within the United States. These hats are home made with love and care. This takes time. Shipping costs $6 and production usually takes 2-3 weeks depending on back log. Time will be confirmed after placing the order. However, if you need them earlier, contact me directly to see if I can fast track your order. Ordering 10 or more hats in the same colors & style? Contact me for special discounted pricing! Ullat Hats was the brainstorm of my mom. She bought a knitting machine around 1970 and set it up in the ski shop she and my dad ran in Mount Snow, Vermont. One day I asked her if she could make me a hat with my name on it. She experimented & when she finally took my hat off the machine - my name wasn't TALLU, it was ULLAT. Little did she know, names have to be put on backwards to come out correctly. 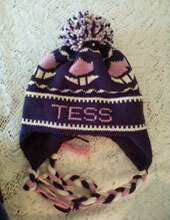 Anyway, it started with a simple pom style hat, either solid or striped. She moved on to a few patterns like snowflakes. Today I continue my mother's tradition with 4 additional shapes, more colors and patterns. "Thank You, It is beautiful! Linked you and put another post about your Hat. We are getting 4000 visits a month now so hopefully you will get a few sales out of it! You can see it at savemagicvermont .com"
"We received our hat today. We love it. Its exactly what we were hoping for. Thank you so much. We will be ordering from you again in the future. We have another baby on the way so we will have to get one for him eventually. I will recommend you to everyone I can. Thanks again." "Hi! I just wanted to drop you a quick note and say "Thank You!" very much for my custom hat that you made for me! It came out wonderful! I am so happy with your work." 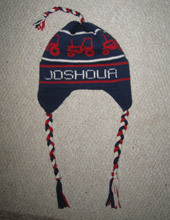 ..."the quality of the hat and the workmanship is amazing!" "Thanks for the great job - we expect the recipient will really really like it and are looking forward to gifting her with it. " "We just got our hats, and it looks like we'll be ordering more the beginning of next week!"